Inquiring minds are investigating the Commerce Department report on International Trade in Goods and Services for February 2015, for clues about first quarter GDP. 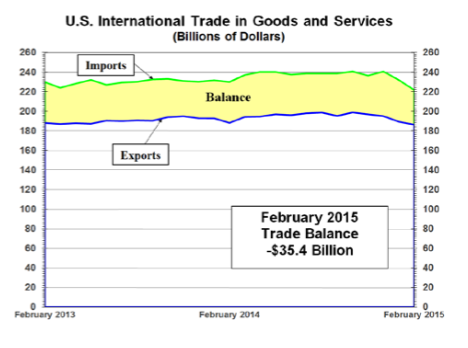 Exports were $186.2 billion, down $3.0 billion from January. 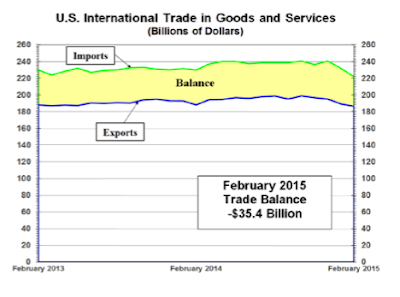 Imports were $221.7 billion, down $10.2 billion from January. Year-to-date, the goods and services deficit decreased $ 2.6 billion, or 3.2 percent, from the same period in 2014. Year-to-date exports decreased $5.3 billion or 1.4 percent. Year-to-date imports decreased $7.9 billion or 1.7 percent. Recall that exports add to GDP and imports subtract from GDP. Thus my first reaction to the report was that GDP estimates would go up. They did, but very slightly. 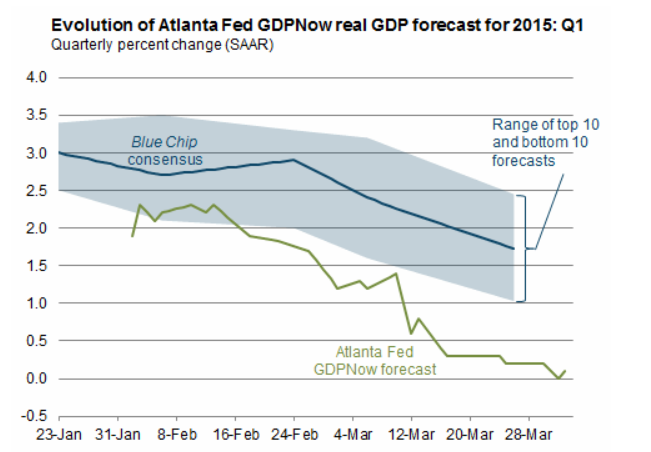 Yesterday, following an Unexpected Decline in Construction activity, the Atlanta Fed GDPNow forecast dipped to 0.0%. Today following the shrinkage in the trade deficit, the forecast is back in positive territory at 0.1%. 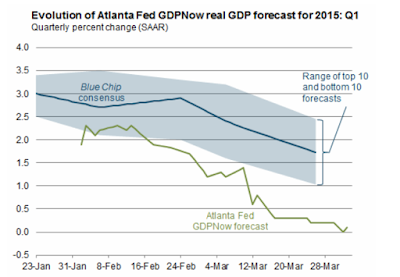 "The GDPNow model forecast for real GDP growth (seasonally adjusted annual rate) in the first quarter of 2015 was 0.1 percent on April 2, up from 0.0 percent on April 1. Following this morning's international trade release from the U.S. Census Bureau, the nowcast for the change in real net exports in 2009 dollars increased from -40 billion to -33 billion. The nowcast for real equipment investment growth declined from 7.5 percent to 6.1 percent following the international trade report and the Census Bureau's M3 manufacturing report." The declining trade deficit is a good thing. However, the shrinking trade deficit is not as positive as it may look at first glance. It would have been far better had the trade deficit shrinkage been on rising exports. Instead, imports and exports are both down. That is yet another sign of the slowing global economy. Back in January, I forecast declining exports on the strength of the US dollar. Here we are. If oil ticks back up for any reason, so will imports. There is not a lot to cheer about in today's reports (Also see Factory Orders Unexpectedly Rise Snapping String of 6 Straight Declines).